Print beautiful borderless photos effortlessly! 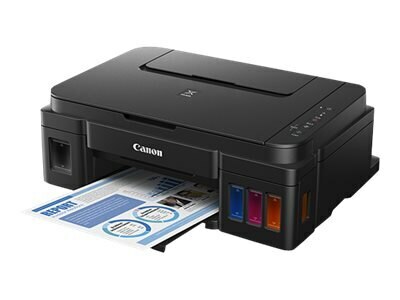 The Canon PIXMA G2200 MegaTank Inkjet All-In-One Printer sets the bar for high-volume, low-cost printing, copying and scanning. With its innovative MegaTank ink reservoir system it can print up to 6,000 crisp black pages and 7,000 magnificent color pages from one set of included ink. That's a lot of pages. In fact, it would take 30 conventional ink cartridge sets to equal that amount of output. But cost-effectiveness isn't the only thing that's amazing, the quality is an eye-opener too. The PIXMA G2200 printer utilizes hybrid inks for deep blacks and satisfyingly rich colors and performs fine 600 X 1200 dpi scanning.